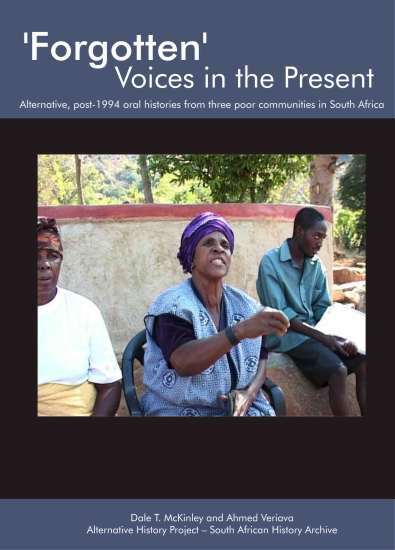 "'Forgotten' Voices in the Present: alternative, post-1994 oral histories from three poor communities in South Africa" was authored by Dale McKinley and Ahmed Veriava and funded by Sephis and the Rosa Luxemburg Foundation. It is the fruition of two years worth of work and commitment to the goal of giving agency to those usually caught on the margins of South African society. The book is made up of carefully selected excerpts of in depth interviews with residents of Maandagshoek, Rammolutsi and Sebokeng. These illustrate, in the words of the respective residents, that South Africa - having overcome formal apartheid - still has a lot of work to do if structural inequality is to be overcome.Accompanied with a DVD documentary revealing valuable footage of the project compiled by Veriava, what makes the project even more unique is the inclusion of full interview transcripts in digital format for use by anyone interested in purveying a different perspective of South Africa's near past. This work forms part of an overall project to alleviate the socio-economic suffering and cultural marginalisation of the rural, peri-urban and urban poor, neglected by a new hegemonic structure "in which social inclusion is increasingly made contingent upon local capital investment." [McKinley, D. & Veriava, A., ‘Voices cry from under new myths about ordinary SA', Business Day, 1 October 2007] The South African History Archive is proud of its involvement in the development of this project over the past two years. A dream deferred from South African History Archive on Vimeo.